While I have been working on some crocheting and knitting, this weekend I've been working on a piece of furniture for my/our new apartment!!! There are no before pictures, just halfway to step one pictures. On the first day, I got to play with paint stripper, a power sander, and ended with really sore hands, arms, and back. Being liberal with paint stripper (not that I have experience) was difficult, and I ended up probably doing more work than necessary. All the white paint is gone, but still needs work! 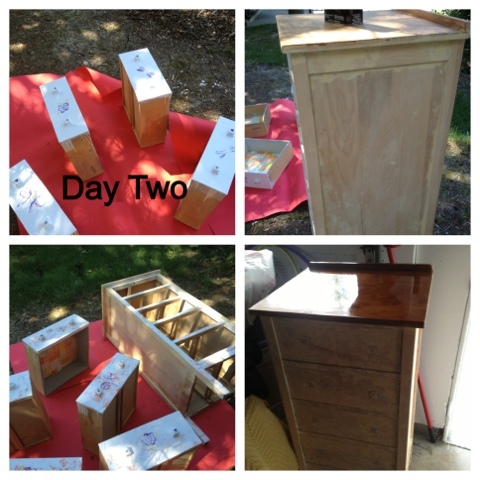 Day two was work on the drawers, as well as paint that I missed on day one. I also put stain on the top (the only bit that is completely sanded and stripped of paint), which is helpful in motivating me to work harder on the other bits. 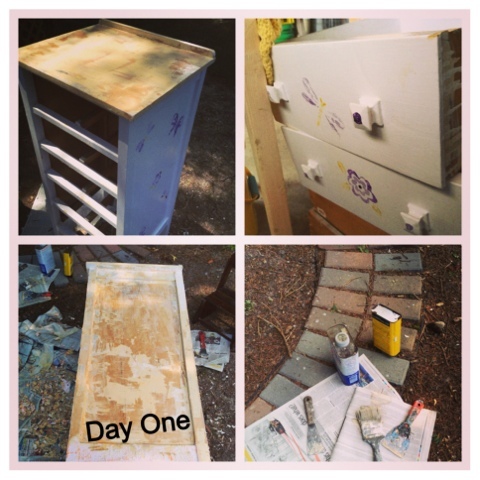 The reason for this dresser makeover? Fiancé really dislikes painted furniture. It was in a little girls room, and it needed either a new coat of paint or a complete overhaul. I counted at least 4 layers of paint, plus the most recent color. If I slapped another coat of paint, it would've needed to be touched up the next time we moved. So I'm striping all the paint, sanding, staining, and then topping it with a coat of poly. It's a lot of work, but I enjoy it. Even though I've been busy with home projects, I do have some yarn to share!!! My stack of books increased yesterday, as I decided to pursue the historical fiction section on Amazon. I didn't expect to get them all at the same time. Titles, in case you can't read them: The Age of Ice, The Light between Oceans, The Kitchen House, and Red Templar. 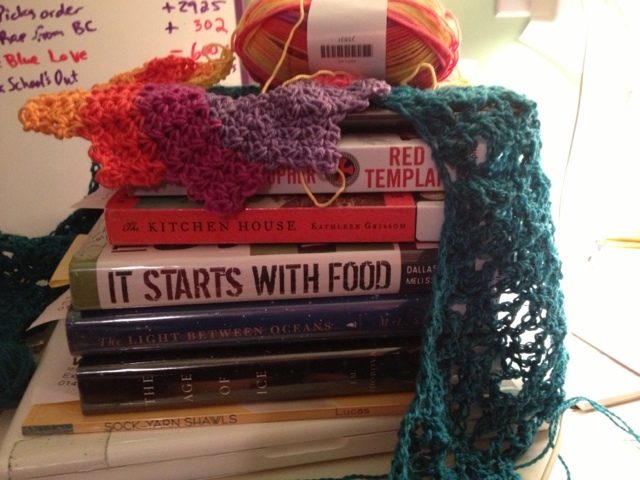 It Starts with Food is obviously not fiction, and I'm still working through it, a bit at a time. And here's a close up of my crocheting, Hitchin' a Ride. Linking up with Tami & Ginny! love the cheerful yarn!! It is beautiful. The repainted chest is going to look lovely in your new place. It's amazing what paint can accomplish!! ooo I love restored/re-purposed/rejuvenated furniture. Giving something a new life. What fabulous yarn for that project, I tried knitting it once but kept losing count, maybe I'll try the crochet version some time. I hope your dresser works out for you, it will be so useful when done! I got about half-way through the Kitchen House and couldn't finish it. I was just too disturbed by the subject matter. I very rarely give up a book (especially once I'm half-way), but I just couldn't do it! Nice yarn! Wow, so much going on for you! that furniture is going to look wonderful! Many blessings to you! I love how your scarf is coming out. Awesome colors!!! Awesome job with the refinishing! I have a desk I stained myself (didn't have to scrape) and it is my favorite piece of furniture because I did it myself. 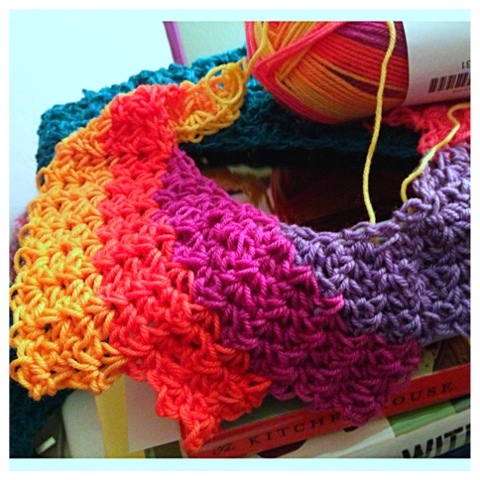 Love the crochet project (and my queue just increased, thanks!)! The Kitchen House was a really great read in my opinion. I like the yarn. What type is it? Never mind. I went to your Ravelry page. I love the crochet! The yarn is great, so colorful! i love self striping yarn. The yarn your using is beautiful, and the shawl is going to turn out lovely! I too give new life to old things. I like your yarn too very bright and happy. My little girl would love it. Thanks for stopping by peeking in on me and leaving a comment on my bag rug. Love the colours in your pretty scarf.